Ion channels are membrane proteins, which play a principal role in regulating cellular excitability. They are found in virtually all cells, and are of crucial physiological importance. Based on the stimulus to which they respond, ion channels are divided into three superfamilies: voltage-gated, ligand-gated and mechano-sensitive ion channels. Voltage-gated channels respond to perturbations in cell membrane potential, and are highly selective for a specific ion, i.e., Na+, K+, Ca2+, and Cl-. They are further subdivided into families based on the major permeant ion. Voltage-gated Na+ channel - These channels are responsible for the generation of action potentials of long duration, and thus are targets of local anesthetics, such as lidocaine and benzocaine. Voltage-gated Ca2+ channels – They regulate intracellular Ca2+ concentrations, and thus are responsible for a wide range of biochemical processes within cells. One of the most important processes regulated by these channels is the release of neurotransmitters at synapses. Calcium channel blockers are valuable in treating a variety of conditions ranging from heart disease to anxiety disorders. Voltage-gated K+ channels – They constitute the largest and the most diverse class of voltage-gated ion channels. They are imperative in generating the resting membrane potential. Voltage-gated Cl- channels - These channels are present in every type of neuron and are involved in regulating excitability and cell volume. They are also known to contribute to the resting membrane potential. LGIC are targets for many drugs, such as anesthetics, antipsychotics, and antidepressants. They are named according to the ligand to which they respond and are divided into three families based upon molecular biology and protein structure criteria. They constitute the largest class of LGICs and include nicotinic acetylcholine receptors (nAChR), γ-aminobutyric acid (GABA) receptors, 5-hydroxytryptamine-3 (5HT3) receptors, and glycine receptors. The nAChR and 5-HT3R are excitatory receptors, while the GABA receptors and glycine receptors are inhibitory in nature. The nAChRs are activated endogenously by the neurotransmitter acetylcholine. Acetylcholine plays an important role in various cognitive processes, such as learning, memory, and attention. It is also an important signaling chemical at the neuromuscular junction. Activation of 5-HT3 receptors plays an important role in a variety of sympathetic, parasympathetic and sensory functions. In the central nervous system (CNS), 5-HT3 receptors are involved in emesis, cognition, and anxiety. It helps in the regulation of various cognitive, physiological, emotional and metabolic systems. It affects physiological processes, such as sleep patterns, circadian rhythms, appetite, aggression levels and body temperature. The GABA receptor selectively conducts Cl− through its pore, which causes hyperpolarization and a resultant increase in the threshold for generation of action potential. A reduction in the probability of action potential generation causes neuronal inhibition. GABA inhibits wake-promoting regions and hence is involved in supporting sleep. Impairment in GABA signaling is also a major reason for anxiety disorders. Benzodiazepines reduce unwanted brain excitability, by increasing GABA signaling in the brain, and hence can be used to treat anxiety disorders. Glycine receptors mediate synaptic inhibition in the spinal cord, brainstem, and other regions of the central nervous system. They regulate the excitability of motor and afferent sensory neurons, including pain fibers, and are also involved in the processing of visual and auditory signals. Hence, they represent a promising target for the development of therapeutically useful compounds. They are activated by the neurotransmitter glutamate and mediate most fast excitatory transmission in the CNS. They are subdivided into α-amino-3-hydroxy-5-methylisoxazole-4-propionic acid (AMPA) receptors, kainate receptors and N-methyl-D-aspartate (NMDA) receptors. AMPA receptors mediate fast excitatory synaptic transmission at the majority of central synapses. Kainate receptors regulate neuronal excitability, whereas NMDA receptors play key roles in synaptic plasticity. They are the most recently discovered membrane ion channels. They are preferably permeable to Na+, K+ and Ca2+ and are activated by ATP. P2X receptors are widely expressed in many tissues and are shown to play key roles in various physiological processes, such as nerve transmission, pain sensation, and various inflammatory responses. 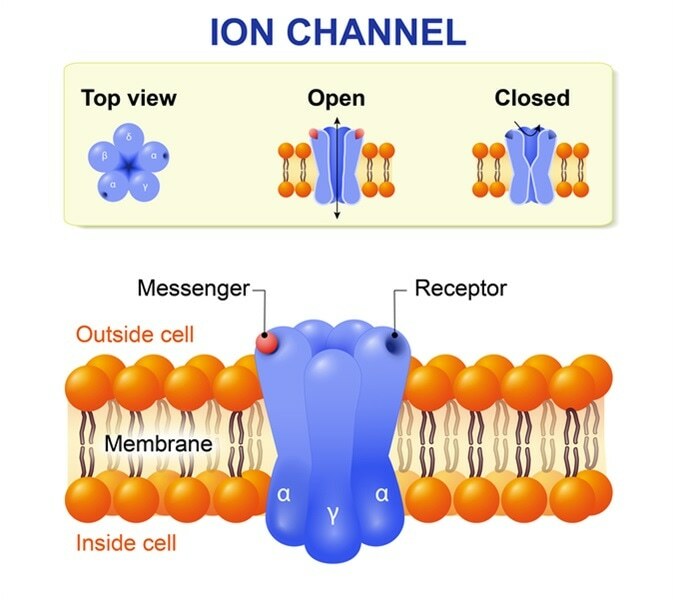 Ion channels responding to changes in mechanical forces on the cell membrane are termed mechano-sensitive ion channels. These channels are involved in detection and transduction of external mechanical forces into electrical and/or chemical intracellular signals. Mechano-sensitive ion channels are involved in regulation of blood pressure and cell volume, stimulation of muscle and bone development, and the senses of hearing and touch. Studies have shown these channels to be involved in various conditions like cardiac arrhythmias, muscular dystrophy, neuronal degeneration, polycystic kidney disease, and tumor metastasis. As ion channels are responsible for the regulation of major physiological functions, an understanding of their mechanisms at a molecular level is important. The past decade has observed pioneering work in the elucidation of crystal structures of ion channels. This has, in turn, led to an increased understanding of how ion channels function. Research has also lead to the discovery of a variety of mutations in ion-channel genes, which are known to cause the various channelopathies. Future research in this field will be crucial in deciphering the causes and cures for a number of neurological and muscular disorders.